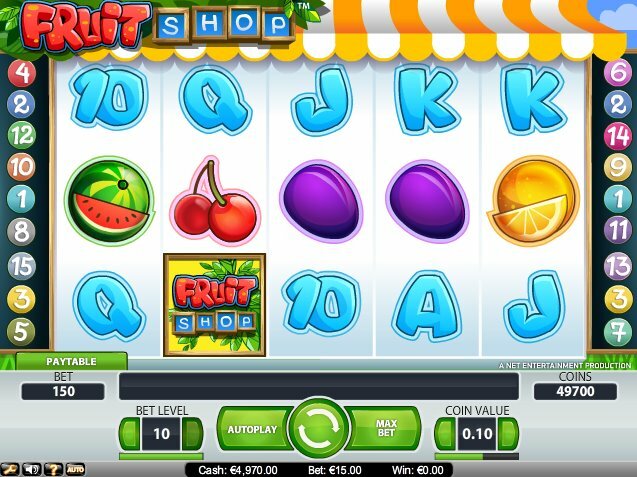 It's fair to say fruit-related slots have always been a hit with online button-bashers over the years - indeed, fruit machines have proved the mainstay of slots since their inception in the early 20th Century - and Scandinavian-based slot developer NetEnt’s Fruit Shop slot is the latest addition to the "fruit salad" of games on offer from your friendly Internet casino. A Classic Slot on Energy Drinks? With bets from $0.01 a coin and a maximum bet of $150, this 5 reel, 15 pay-line slot caters for all wallets. Filling out the reels are some colorful blue 10-through-Ace card symbols in bubble font and some nice fruit icons like lemons, cherries, plums, and oranges. The Fruit Shop's Gone Wild! The Wild in the game is the Fruit Shop symbol, substituting for all symbols (those nice people from Net Ent know which side their bread is buttered). The Wild icon also doubles any win you get when forming a winning combo, but be aware, it does only appear on Reels 2, 3 and 4. There are free spins galore if you manage to hit cherries symbols on the reels. Two cherries in a row awards one free spin, as does hitting three cherries, while four cherries gives you two free spins, and five cherries five freebies. 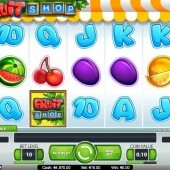 Free spins are also awarded for various combos of fruit symbols. If Fruit Shop has got you in the mood for some no-nonsense fruity slots action on your PC or laptop, check out Microgaming’s classic slot, Cash Splash, while Reel Rush, NetEnt’s beautiful and simplistic slot with 3,125 ways to win, is another must-play. However, fans of solid bonus rounds and Wilds that don't have to be hit on one tiny segment of the game screen may well feel a little cheated. For me, the exotic fruit of Big Kahuna, Microgaming's progressive behemoth slot will never stop calling.